Delta Vacations gives you more ways to rack up miles, and earn toward your Medallion® Status. SkyMiles® Members earn up to 3,000 bonus miles per person, in addition to credited flight miles, with a flight and Gold, Silver or Bronze package. 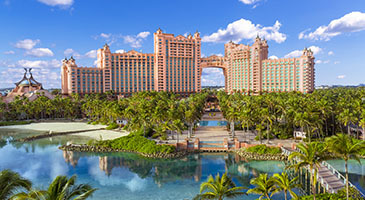 *Sample Pricing: This offer is available from hundreds of origin cities, but this price, which reflects the offer, is based on travel between Atlanta and Nassau, staying at The Royal at Atlantis. Price is per person, based on double occupancy and select Sunday departures and returns, June 23 – 30, 2019, and is subject to change. Additional restrictions and baggage charges may apply. See Terms and Conditions for details. Nassau is known for its white-sand beaches, turquoise waters and a range of accommodations from ultra-exclusive villas to family-focused resorts. Guests can chase thrills at a water park, roll with the good times at two of the largest casinos in the Caribbean, and embark on sailing, fishing, diving and snorkeling in some of the clearest waters in the world. Minutes away, Nassau’s historic downtown offers a local distillery and the first Bahamian craft brewery, as well as a variety of boutiques and many tasty restaurants. This awe-inspiring resort features 1,800 rooms, suites and residences with contemporary decor, high-end amenities and mesmerizing vistas. Lounge on the pristine beach, enjoy vibrant nightlife at the casino, indulge in spa rituals, and savor cuisine at your choice of several onsite restaurants, bars and lounges. The Royal is the icon of Atlantis, featuring the awe-inspiring mythology of the Lost City of Atlantis risen from the sea. From the artwork to the experiences, a stay at The Royal is larger than life, with intimate proximity to the world's largest open-air marine habitat situated at its center and the famed Atlantis casino by its side. Purchase any Delta Vacations flight and hotel package from any Delta Vacations origin in the U.S. or Canada to Nassau, April 10 – May 15, 2019, for travel April 10 – December 31, 2019. The hotel discount is based on the standard room charges of each of the participating hotels in Nassau, Paradise Island. Participating hotels include: Comfort Suites Paradise Island, Grand Hyatt® Baha Mar, Rosewood at Baha Mar, Sandals Royal Bahamian Spa Resort & Offshore Island, SLS Baha Mar and The Royal at Atlantis. Get a one-category room upgrade with any room you book. Offer not valid for Suites room categories. Book April 10 - May 15, 2019, for travel April 10 - December 31, 2019. Receive a one-category room upgrade at check-in, based on availability. Stay 3 nights to receive a $75 credit. Stay 4 - 6 nights to receive a $150 credit. Stay 7 nights to receive a $200 credit. Credits are per room, per stay, and valid for purchases at the pool bar, Bamboo Lobby Bar and Crusoe’s Restaurant. Kids, 11 years old and younger, eat free at Crusoe’s Restaurant when dining with a paying adult. The meal participation card must be presented when ordering lunch or dinner. Kids choosing from the kid's menu will eat free. or adults receive a discount credit toward any adult menu item. This offer has no cash value. There is a minimum charge required for lunch and dinner, per adult, and reservations are recommended. Book by May 15, 2019, for travel through November 15, 2019. To receive the highest discount of 30% off, travel August 18 - October 31, 2019. Book by May 15, 2019, for travel July 1 – October 31, 2019. Blackout dates: July 28 – 31, 2019. 1 free night is included with a 4-night minimum stay. Book now, for travel June 1 – October 31 & December 1 – 19, 2019. 1 free night is included with a 5-night minimum stay. Book now, for travel April 23 – May 31 & November 1 – 30, 2019. To receive the highest discount of 65% off rooms, travel through December 26, 2019, and stay in the Romeo & Juliet One Bedroom Butler Villa Suite with Outdoor Tranquility Soaking Tub, Royal English One Bedroom Walkout Butler Villa Suite with Patio Tranquility Soaking Tub, Royal English Walkout Butler Hideaway Villa Suite with Patio Tranquility Soaking Tub, Windsor One-Bedroom Butler Royal Suite, Windsor Honeymoon Hideaway Swim-Up Crystal Lagoon Zen One-Bedroom Butler Suite, Windsor Oceanview One-Bedroom Butler Royal Suite, Windsor Honeymoon Oceanview One-Bedroom Butler Royal Suite, Windsor Oceanview Walkout One-Bedroom Butler Royal Suite and Windsor Oceanfront Penthouse One-Bedroom Butler Royal Suite room categories. Savings are reflected in the price. Offer valid based on a minimum occupancy of two people per room. Kids, 12 years old and younger, eat free from the kids menu at participating restaurants, when accompanied by an adult purchasing a full meal. Book by May 1, 2019, for travel June 1 – October 31, 2019. Up to $300 in resort credits per room, per stay. Stay 7 nights to receive a $300 resort credit. Stay 6 nights to receive a $250 resort credit. Stay 5 nights to receive a $200 resort credit. Stay 4 nights to receive a $150 resort credit. Stay 3 nights to receive a $100 resort credit. Offer only valid for bookings of flight and hotel packages. 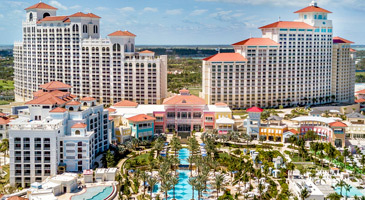 Resort credit may be used for Dolphin & Marine Adventures, Atlantis Kids Adventures, CRUSH, Atlantis Pals, Atlantis Speedway, Atlantis LIVE performances or select food and beverage outlets. Resort credit may not be used for laundry service or at any of the following outlets: Mandara Spa, Ocean Club Golf Course, the Casino, Marina Starbucks, the Atlantis Signature shops or any other retail shops. It may not be used on gratuities for food and beverage consumption, in-room movies or phone calls, transportation/transfers/taxes or nightly mandatory fees. Book and travel by December 20, 2020. Blackout dates: April 6 – 27, July 7 – 12, November 27 – 29, December 20 – 31, 2019; January 1 – 3, February 14 – 17, 2020.